As the year ends, I want to say thanks for a few new media pieces that have appeared recently. The photo by Marta Calvo was taken on the terrace of La Central bookstore in Barcelona, when I was visiting to promote the Spanish version of Peace, Love & Petrol Bombs. 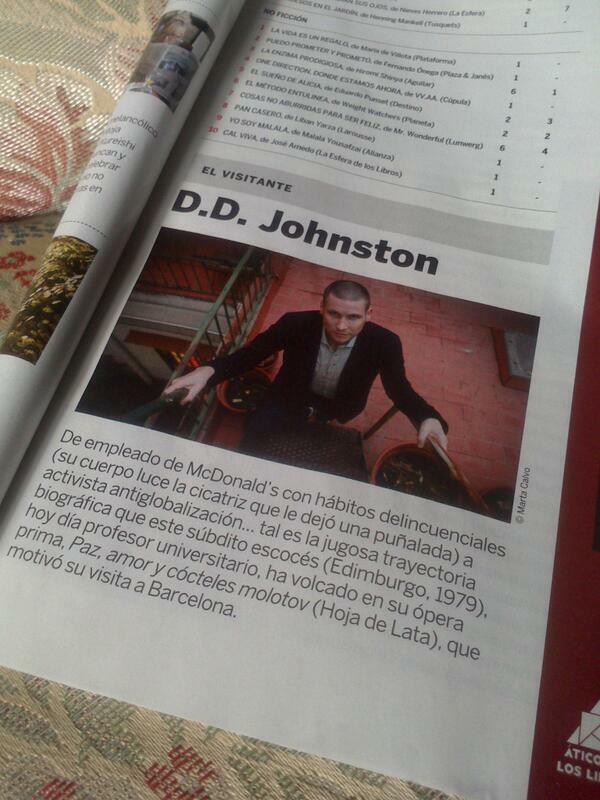 The picture’s in the top Spanish literary magazine, Qué Leer. Readers are likely to find Thrub either exciting or precious, but few will disagree that this is an ambitious, erudite work with a profound interest in the world as we find it. This interest encompasses unexpectedly vivid sensory descriptions, scenes of violence such as those found in Babel, a junction of philosophy and farce reminiscent of Stoppard, a B.S. Johnson like use of distancing, and an ongoing dialectic between Kantian and post-Kantian theories of being and action. In addition, last week I had the pleasure of chatting with journalist Michael Donnelly, who’s recently launched an independent media venture: S:News. The interview’s available to read here. As expansive in its scope and even more ambitious in its characterisation, DD Johnston’s The Deconstruction Of Professor Thrub spans poverty-stricken Belfast, the Spanish civil war and Hungary 1956. A galloping discussion of free will and skit on academic life, it’s a book that frequently explodes with raw and unexpurgated humour.